I think about ice a lot. I do; it’s an American thing. Where I come from, we drink everything with ice apart from beer, which we drink from mugs we keep in the freezer. So you won’t be surprised when I tell you that I was thinking about ice recently, and remembering the trays we had in the 70s – they were metal and had a removable partition that came out of the tray with the pull of a lever and released the cubes. Ice cubes were left lying in the tray, loose and ready to go, as if by magic. Pull lever, release ice. 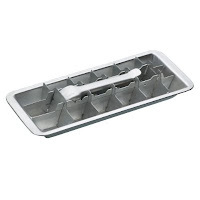 None of the frostbite associated with prying ice loose from rubber trays, none of the breakages associated with plastic trays. Just simple, old fashioned, mechanical ingenuity. Captivated by memories of my ice-filled youth, and too poor to buy one of those giant fridge-freezers with an icemaker attachment, I searched the web for those metal ice trays. They are available to buy on Amazon, for a very reasonable £5 each. I bought 4 of them, because my need is great. I tested them out, and the results were substantial blocks of ice, each one as pleasingly craggy as a chunk of quartz. I broke out the whisky (I know, I know, but see above, re: ice in everything) and made myself a drink. The cubes didn’t dissolve within seconds, as is the case with what normally passes as ice these days. When I drank, I got that satisfying chink you hear when people drink highballs in Dallas or Hart to Hart, or some similarly sophisticated night-time drama. Yes, they have made all my ice dreams come true. Now if only I could get my husband to stop pretending that ice cube trays need to be washed between every use. Just refill them, okay? And stop putting them in the sink as if you are actually going to wash them.